The Great Lakes impact our lives in many ways—from drinking water, growing food, creating the weather, manufacturing products, atmospheric deposition of pollutants, transporting goods and natural resources, and global warming. Lake Superior contains 50% of the water in the Great Lakes—which equates to 10% of the world’s freshwater and nearly half of the United States’ and North America’s freshwater. 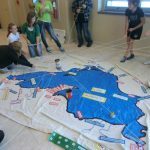 These floor maps are an effective way to engage students in learning about Lake Superior and understanding the watershed concept. These floor maps are a terrific teaching tool for K-12 schools, museums, and education centers throughout the Lake Superior watershed: Minnesota, Michigan, Wisconsin, and Ontario. Anyone can order the map, and there are NO requirements for holding workshops, acting as a lending site, nor maintaining and submitting records. 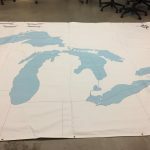 Floor Map: 9’ x 12’ vinyl cloth upon which has been printed lake outlines and the boundaries for Canada and United States, WI, MI, MN and Province of Ontario. Please follow this link to our online storefront to purchase!